What is the minimum number of conversions an ad set needs in order to take advantage of conversion optimization? Will increasing my budget by more than 10% throw a wrench into my optimization? Should I be using Daily Budgeting or Lifetime Budgeting? How important is my Relevance Score? Ask these questions to 10 different Facebook marketers and you’re likely to get 5 or 6 different answers and probably a couple of heated arguments. 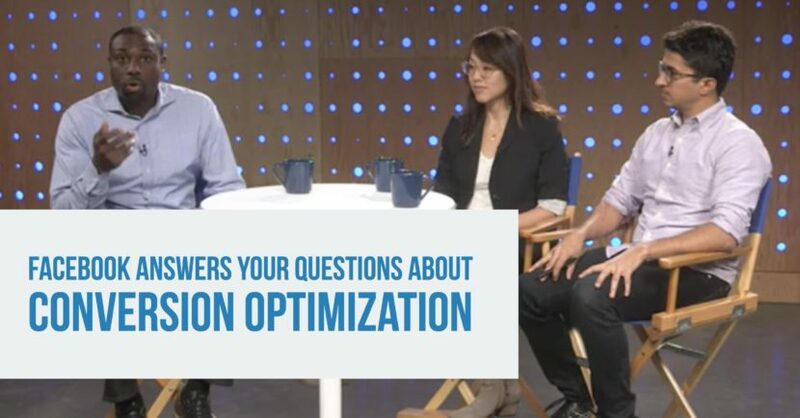 But a couple weeks ago, in a somewhat rare display of transparency, Facebook pulled back the curtain with a live video posted in the closed Facebook Group “FB Auction Live,” to answer some of the most common questions about Conversion Optimization. On hand for Facebook were Amy Lee, Product Marketing Manager for Facebook, and Ramnick Arora, Principal in Monetisation for Facebook. I would encourage you to join the group, if for no other reason, to have immediate access to this and future videos. As you might guess, someone has already snagged the video and posted it on YouTube. The guy who posted it goes by the name of Diarrhea Blaster so if what you’re seeing below is not the FB Live video, blame DB. Let’s go through some of the questions that were asked and see what the FB team had to say about them. Question: Is there a minimum number of conversions that we need to make conversion optimization work? Most reliable sources will tell you that you need about 20 conversions a day to even think about setting conversions as your optimization goal. Good news. Facebook says it’s more like 25 a week. Obviously, more is better because the system has more data – more people – to learn from. But 25 a week gives the system enough to go on. Also, in the comments of the post, another FB guy weighed in on this, adding that 25 a week was the minimum — they would prefer at least 5 conversions a day to minimize volatility in the ad set. Now, an interesting tangent to this discussion came along when the question was posed: “What if you aren’t getting 25 conversions a week?” That’s a legit concern. Maybe you sell some super high priced item or service where 2 or 3 conversions a week is a huge score. For the conversion-starved, they suggested moving your conversion event up the funnel. In other words, let’s say you define your conversion event as “visitors who made it to the ‘thank-you-for-your-order’ page.” And let’s say you’re getting 10 conversions a week. Redefine your conversion. Make it, say, an add-to-cart instead of a thank-you-for-your-purchase. You’ll more than likely see conversions increase. True, now you are one step farther away from your true goal, but at least you’re giving the system some seed data to help it get people to the next-to-last step. One final point about this. The Facebook algorithms are very much “ad set centric.” It’s that ONE individual ad set that offers the learning needed to make intelligent decisions on your behalf. So if you were hoping that two ad sets each pulling in 12 or 13 conversions a piece would equal one ad set pulling in 25, you’ll be disappointed. That’s not how it works. My takeaway here was it’s better to use lifetime budgeting. Looked like Amy might have kicked Ramnick underneath the table on this one but he’s more intimately familiar with the algorithms. Basically, he said that, with a lifetime budget, the system has more wiggle room to find the best times to deliver ads on your behalf. Daily budget adds a layer of constraints on the system. Daily used to be very rigid but as they pointed out, Daily is a little looser so the difference between Daily and Lifetime is not as pronounced as it used to be. Question: What’s the impact of switching or changing something in an ad set? The biggest no-no, they said, is changing your conversion event. Once you’ve started getting delivery, leave it alone or create something new. According to FB, if you are targeting the same person in two different audiences (overlap), the system will choose the one ad it deems most appropriate for this person and move it forward in the auction. Question: How much does previous account history and activity affect how my ads are delivered? Account history plays a role but not an overly significant one. Basically they said focus on other things. Life is short. Question: How important is Relevance Score? Experience has taught most of us that Relevance Score is meaningful but not always that accurate in determing the success or failure of an ad. The FB team didn’t contradict this. Is it good to have a high RS? Yes. Does a low RS mean your ad is worthless? No. Question: Does overlapping audiences impact optimization and delivery? According to FB, if you are targeting the same person in two different audiences, the system will choose the one ad it deems most appropriate for this person – one ad out of all of the ads in the two ad sets — and sends it forward in the auction. So you are NOT competing with yourself. The system puts the person in one of the two audiences for you. I hope you enjoyed this question by question trip through Facebook’s Conversion Optimization video. There are a few not included in this post but these were the ones I found most interesting. Like I said, might be a good idea to join the FB Auction Live Facebook group. They say they’re doing quarterly videos but it sounds like there will be another one of these gems up in a month or so. Also, the comments section has a gold mine of info, as well, with multiple FB personnel answering questions, so that’s worth a look, too. If you come across anything interesting about Facebook advertising, send it my way.